Type ‘women housework’ into any online search engine and you probably won’t be surprised by the results. Because despite years of being sold the dream that men and women are getting closer to career equality, one thing remains unchanged – keeping the family home clean and tidy is still firmly our responsibility. In fact, just one scan down the first page of results of an online search reveals article after article just like this one, and they all ask the same question: why are women still doing most of the housework? The reality in most homes around the UK (if not the world) is that working women spend as much as twice as many hours managing the household responsibilities and taking care of children as working men. But why is this? 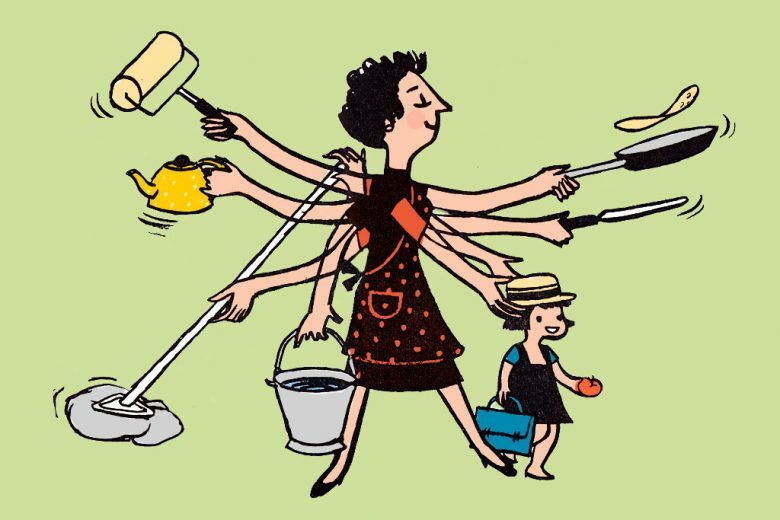 And, if you’re unhappy about the housework (im)balance in your own home, what can you do about it? Relationship expert and life coach Sloan Sheridan-Williams discusses the issue and suggests a diplomatic solution. It’s no surprise to many mums to learn that we usually get the rough end of the housework stick. And while very few of us (men or women) actually like housework, the reasons why the laundry and vacuuming chores usually fall onto us can be tricky to fathom. One reason may be that men judge themselves on different criteria. Men often define their significance by their career, which can result in them overworking or putting connections with friends and colleagues over family responsibilities. This can mean they spend less time in the home, or feel they’re too exhausted or have better things to do at home than cooking and cleaning. Or they may just thoughtlessly fall into the assumption that housework is a traditionally a female role. While it’s easy to view your partner as a career equal when you’re both consumed with work, once children come along it’s hard not to slip into traditional gender roles, especially if your own mums were in charge of the home when you were growing up. And what if you’re not happy about it? Many couples manage to find a balance that keeps everyone happy, or at least works for them. But what if you’re not content with the division of labour in your home? What if you don’t feel that the amount your partner does is enough, or is fair? What if you’ve reached a tipping point and don’t want to accept how things are any more? If you’re not happy with the status quo in your own home, what can you do to broach the subject and agree a solution that you can both agree on – without causing a row? While women often voice to their friends about how much they have to do around the home, they’re not always as clearly vocal with their partners – which can sometimes enable their men to be emotionally or physically absent when it comes to their relationship roles and responsibilities. As women we often unintentionally reinforce the pattern of men getting away with their bad behaviour, while silently (and sometimes not so silently) exhibiting signs that range from mildly peeved to extremely resentful. But without some form of actual change taking place, your negative emotion will only increase – something I see happen in many marriages. Resentment can be a very informative emotion, and a signal to change not only your perception but your behaviour. Anger at any level tells you about your fundamental expectations, and that a belief system that is important to you is being tested – or perhaps even violated. What this highlights is that your rules about how your husband should be behaving in your eyes and his rules are not aligned. And when this happens you have two choices: change yourself or communicate your rules, and how his behaviour is not in line with your expectations. If you can, try to find a happy compromise between the two options. Not only will this bring the best results, but it’s also important to remember that marriage is a partnership, and your way might also have its flaws. While we may love our men, we have to accept that they’re not perfect (as aren’t we), and their misdemeanours can come in many different forms. Some negative behaviours may come with huge red flags – for example, a level of irresponsibility that suggests a character issue as opposed to reactionary circumstantial one. Lesser crimes, such as hanging out with friends, relaxing and avoiding responsibilities with the children or around the home, raise merely orange flags. And minor irritations such as coming up with excuses to get out of things because they’re lazy, are worthy only of yellow flags. Are you prepared for the answer? It’s YOU! Yes, you let him get away with it. You have at some point allowed behaviour you find unacceptable to continue without clear communication to your partner that it is severely compromising your happiness, and therefore your connection to him. In a way, it’s not your partner’s fault. He’s not a mind reader, and as he is already exhibiting signs of laziness, he’s probably not looking at ways of improving your relationship. You may also perhaps have chosen to be with someone with his characteristics in part because of issues you haven’t dealt with yourself yet. By choosing someone who avoids responsibility, you are forced to assume it. Why may that be? And what could you be avoiding by allowing this situation to come about? As you find new solutions to your current situation and let go of responsibility, there may be times when you experience uncomfortable feelings. Are you ready to share that responsibility? And when you let go, will he step up? It’s also important to remember that men do not always comprehend subtlety, so you need to consider how much responsibility you will need to let go of before he even notices the house is a mess, and the children haven’t been fed. So what can you do to initiate a positive change in your home? And break habits in your relationship that may have become ingrained over months or even years – without alienating your partner? I encourage you to take the time to have logical, clear, concise upfront conversations with your partner, and decide to make a pact with change on both sides. Agree that you can both hold one another accountable for the other’s behaviour. Successful upfront conversations often include clear parameters where the man knows that the conversation will be over soon and has a solution – remember men are goal-orientated. For example, explain to him that if he is going to be late coming home, not to wait until the last minute to tell you. It’s also wise to give him an example he can understand, relating it back to his work or another of his intrinsic drivers. A good idea could be to explain you would like to be treated with the courtesy he gives a work colleague at the very least. Explain your needs and that if he does X you can do Y and will be in a better frame of mind. Keep it simple for him. Behaviour X gets reaction Y. Then change the subject. Only take one issue at a time and leave a few days in between them. Other good ways are to make jokes about what it is that pushes your buttons. A simple this is not the 1950’s and “What’s for Dinner?” is not a substitute for ‘Hello’ can often, when delivered to the right man at the right time, shift his behaviour on the minor points. Men also like to feel needed. So if you can boost his ego while asking for your genuine needs to be met, you could be on to a win-win situation. Explain his role as your superman (whatever that means to you) – maybe it’s when he shows he is a good father or when he takes time out for you. Men adore women who allow themselves to be slightly vulnerable (don’t go overboard though), allowing them to step up. You need him to be there for you but you do not need him to be your father. There is a fine line, so do not cross it. Finally, if he just doesn’t agree, or you can’t get him to put the golf clubs down or skip Friday curry night with his friends and work at something, I’d talk to a mentor couple, or a relationship expert. You are his wife not his enabler. It takes a great man to step up but why should you accept less? Your marriage needs to be transformed and you are just the person to do it. While addressing what may well have become a common battleground, or a bone of mutual contention isn’t always easy, with the right approach you can identify habits that you want to change. And together steer your relationship into calmer, fairer waters – just like this couple who eventually found a workable solution to their own housework wars that made them both content. Happy conversations! Sloan Sheridan-Williams is a relationship expert and life coach. Visit her website for more information. She’s also on Twitter and Facebook.